While advances in large molecules have been rapid, small molecules still make up the vast majority of active pharmaceutical ingredients (APIs) developed today.1 As drug development has become more sophisticated and the fundamental understanding of the underlying causes of diseases has evolved, many small molecules developed recently have shown incredible efficacy. A great example of this is sofosbuvir (Sovaldi), a small molecule API developed for the treatment of the hepatitis C virus (HCV). 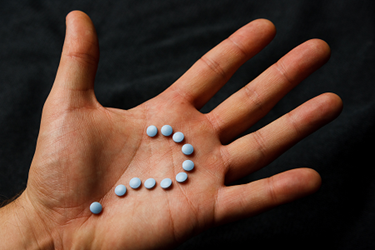 Sofosbuvir has shown incredible efficacy and allowed doctors to cure many patients. As drug development has evolved, so have the small molecule drug candidates being evaluated by biotech and pharma companies. Many of the drugs developed today are highly complex and often display physical properties that are less than ideal. For example, many compounds developed today possess high molecular weight and high partition coefficients (i.e., LogP, a measure of the lipophilicity of a molecule) and, as a result, very low solubility. In order to achieve the desired pharmacological properties, the active ingredient within a drug needs to enter systemic circulation. Hence a drug substance must first dissolve in the gastrointestinal tract, and it must then be transported through the intestinal membrane. Drug molecules are then transported via the portal vein to the liver and enter systemic circulation. While transport through the intestinal membrane is an important factor (which is described as permeability), poor solubility is most often the limiting factor in the bioavailability of drug candidates. 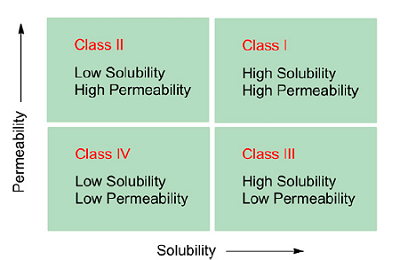 The effects of solubility and permeability are described by the Biopharmaceutics Classification System (BCS) (see Figure 1). In this classification system, drug candidates are divided into four categories depending on their permeability and solubility. While there are drug candidates that suffer from poor permeability and solubility (e.g., paclitaxel), it is estimated that 70 percent of today’s drug candidates fall into the BCS class II, where solubility is the limiting factor for bioavailability. Is Your Supplier Ready To Address Solubility Challenges? It is, therefore, critically important for many of today’s drug candidates to select the right physical form early in development to ensure the active ingredient can be delivered in the optimum fashion. It is also important to consider whether limited bioavailability is the result of poor dissolution properties or limited solubility. In the former case, reducing particle size is often a viable approach. You should ask your drug substance CDMO about its capabilities and experience with developing products with a defined small particle size. Micronization by means of jet-milling is often the preferred technique for this, and it is important to understand your partner’s R&D and manufacturing capabilities in that area. When solubility is the limiting factor, the approach is often to either look at more soluble forms of the API such as amorphous material (which usually is stabilized within a polymeric matrix to form an amorphous dispersion) or look to enhance solubility using formulation techniques such as lipid formulations. Does your partner have the expertise and equipment to develop spray-dried dispersions or lipid formulations? The knowledge gained during the development process also needs to translate into manufacturing. In simple situations (for example, where no special formulation is required and the desired physical form is obtained under a broad range of conditions), in-process checks of the solid form might not be required. However, sometimes crystallization conditions have to be very precise to achieve the target profile, so ask your potential partners what equipment is available to monitor crystallizations on pilot plant scale. Does your potential partner have the ability to monitor particle size or polymorphic form in situ? There are, of course, many other approaches to address poor bioavailability, and a comprehensive overview is beyond the scope of this article. One technique worth mentioning is co-crystals, which have seen a marked increase in interest over the last few years due to changes in their regulatory classification. Similar to salts, co-crystals allow for the modification of the physical properties of an active ingredient such as solubility, which has prompted many companies to include co-crystal screening in their pharmaceutical development plans. Today’s technologies enable us to develop even the most challenging drug candidates into viable commercial drugs. Before the aforementioned sofosbuvir was available commercially for the treatment of HCV, another option was the now-discontinued telaprevir (Incivek) developed by Vertex Pharmaceuticals. Telaprevir is a highly crystalline material with extremely low solubility at 4.7 µg/mL which, remarkably, is lower than the solubility of marble.3 Despite that formidable challenge, the Vertex team was able to develop an amorphous dispersion, which overcame this problem and allowed for the successful commercialization of the drug. There are many technologies available today for controlling physical form and increasing poor bioavailability, so ask your potential partners about their expertise and capabilities in this area, especially if your drug candidate has significant bioavailability issues. Stay tuned for part 4 of this series, where we’ll discuss the importance of understanding your potential partner’s sweet spot. Adapted from: Amidon GL, Lennernäs H, Shah VP, and Crison JR, Pharm Res 1995(12), 413–420. Bernhard J. Paul, Ph.D., is the founder and principal consultant at Carinth Consulting LLC, a drug development consulting firm based in the Boston area. He has worked within biotech and for multiple CDMOs in the U.S. and Europe, and he uses his extensive experience to advise companies on all aspects of small molecule development and strategy. Dr. Paul is the author of 21 U.S. patents and multiple peer-reviewed articles. He holds a Ph.D. from the University of Florida and an undergraduate degree from the University of Graz, Austria. He can be contacted at bernhard.paul@carinthconsulting.com.